Arthur Szyk, The Arthur Szyk Society, Burlingame, CAWashington and His Times, The Struggle on Concord Bridge (1930), Paris. After the outbreak of the Revolutionary War, the thirteen American colonies needed a government to replace the British system they were attempting to overthrow. The Founding Fathers’ first attempt at such governance was formed around the Articles of Confederation. The Articles of Confederation were first proposed at the Second Continental Congress in 1777 in Philadelphia. They were fully ratified and put into effect in 1781. The reign of the Articles of Confederation was brief. Why did the articles of confederation fail? What were the flaws of the Articles of Confederation and how did it distribute power? Read more to discover why by 1789 the former colonies were under the law of a new governing document—the Constitution of the United States of America. Specifically, the lack of a strong national government in the Articles of Confederation led to three broad limitations. The first flaw of the Articles of Confederation was its economic disorganization which led to financial hardship for the emerging nation. By the late 1780’s, America was struggling to compete economically and pay off the debts it accumulated in its fight for independence. These problems were made worse by a series of economic limitations present in the Articles of Confederation. America in the mid-1780’s was plagued by economic chaos that originated from the national government’s inability to manage trade. Under the Articles of Confederation, Congress had limited power to regulate trade. Congress was only able to regulate trade and commerce with Native American tribes and, even then, only if it did not impair an individual state’s ability to monitor its own trade. Congress had no ability to negotiate trade agreements with foreign countries. The central government could enact foreign treaties, but such treaties were specifically barred from policing imports and exports. While Congress had the right to regulate all forms of American currency, the Articles failed to call for a singular form of currency. This meant that the national government could print money, but each state could as well. Consequently, America had no uniform system of currency which made trade between the states, and with foreign entities, much more difficult and less efficient. Artists’ Suffrage League (1907-c.1918)A suffragette addressing the Chancellor to question him about the spending of taxes. How that money was raised, within each state, was up to the state legislatures. Unfortunately, this money was oftentimes not raised by the states or given to the national government long after it was due. As a result, Congress faced substantial revenue shortfalls. Without payment from the states, Congress struggled to pay off America’s foreign debts and was incapable of fulfilling its other tasks, such as managing foreign affairs. Moreover, the unpredictability of the central government’s revenue stream made establishing a national budget nearly impossible. Not knowing how much and when states were going to pay their share severely handicapped an already-limited national government. In short, it was a lack of economic unity that brought about many of America’s economic woes during the years under the Articles of Confederation. Congress had few effective means to enforce its laws, raise revenue, or regulate the economy. The result was a disorganized economy that lacked the ability to pay for itself.. 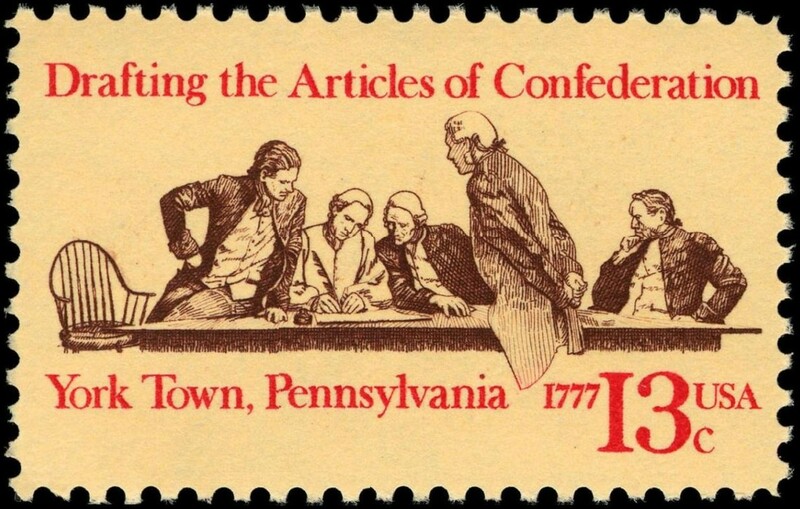 The second series of limitations that the Articles of Confederation had to contend with deal with was the lack of central leadership it provided. As detailed earlier, the Articles placed sovereign power in the hands of the state. Most critically, this led to economic troubles, but it also led to leadership deficit. Lack of national leadership took various forms. Consequently, states could overturn national actions that they found objectionable. Since Congress had no means to enforce its laws, the states could simply ignore national laws without fear of retribution. Also, since there was no national courts system, individual persons or states could not file complaints against the national government. The states could always ignore anything they disagreed with, but if a citizen had a grievance with the national government there was no system in place to hear the lawsuit. One of the glaring differences between the Articles of Confederation and its successor—the Constitution of the United States—was its lack of a chief executive. Most notably, the lack of a presidential figure or body left America without a representative to conduct foreign affairs. Britain actually complained of such difficulties, protesting that they did not know who to contact in order to initiate diplomacy. Without a single executive to act as the head of foreign affairs, America was at a serious diplomatic disadvantage. Instead, the national government had to rely on state militia. Since it was dependent on state troops, Congress was severely limited in its capabilities to quickly and effectively responding to internal and external threats. Abroad, Congress failed to defend American from the continuing threat of Britain following the Revolutionary War. Shortly after signing of the Treaty of Paris in 1783, Britain began to break the agreement. Bickerstaff’s Boston Almanack of 1787 (c. 1787), National Picture Gallery, Smithsonian Institution.“Shays’s Rebellion.” The portraits of Daniel Shays and Job Shattuck, leaders of the Massachusetts “Regulators,” 1787. By 1784, the British were infringing upon American fishing rights and the British Royal Navy was impressing American sailors into forced conscription. Without the aid of a unified military, though, Congress was incapable of fighting back and protecting America’s sovereignty. At home, the inability of Congress to decisively put down the internal threat of Shay’s Rebellion was a direct result of the lack of a capable national army. The rebellion began in 1786 due to the post-war economic depression and the American government’s harsh policies in response to the economic downturn. Rebels initially protested peacefully, resisting the collection of taxes and debts from struggling Americans. However, following the arrest of several of their leaders, rebels became much more militant. The national government failed to come up with the funds to raise an army capable of putting down the rebellion. It took a group of rich merchants from Massachusetts pooling their resources to pay for a militia. The rebellion was eventually put down, but the inability of the national government to act effectively made the weaknesses of the Articles of Confederation ever more apparent. Shay’s Rebellion served as one impetus for the creation of a stronger, central government in the upcoming Constitution. Lastly, the Articles of Confederation proved ineffective because of a set of rules that made legislating under this framework inefficient. As a result, small states and large states had the same voting weight in Congress andthere was no proportionality in voting matters. Considering the large discrepancy in state populations, states with larger populations were quite unhappy with this set-up. For example, in 1780, Virginia had over ten times the number of citizens as Delaware. In fact, Virginia had twice as many people as every state except for Pennsylvania, yet each state received only one vote in Congress. In a pre-calculator era, one might think that ”one state, one vote” would make it easier to pass laws. Regrettably, the opposite rang true since it took the consent of nine of the thirteen states to approve legislation. This meant that blocking a bill took only five of the thirteen states. In 1780, the five least populated states—Delaware, Rhode Island, New Hampshire, Georgia, and New Jersey—had a total population of less than 400,000. Virginia, on the other hand, had a population of over 500,000. Thus, a unified population smaller than the single state of Virginia could block any piece of legislation presented in Congress. A very small percentage of the American populace could preclude bills from passing that could benefit the majority of Americans. This meant that any amendment had to have the consent of the national Congress and all of the states. Requiring a unanimous vote made it extremely difficult to pass changes. Ironically, the fact that the Articles of Confederation was so poorly structured that it did not have mechanisms in place to fix itself. Ultimately, the Articles were scrapped altogether in favor of an entirely new governing document. The main difference between the Articles of Confederation and the Constitution is that the Articles called for a confederate style of government, whereas the Constitution outlined a federal form of governance. The divergence between confederate and federal models occurs when sovereign power is granted. In a confederate government, that ultimate power resides in regional and local governments. The central government only has as much power as regional governments are willing to give to it. The only noteworthy examples are the Articles of Confederation and the Confederacy during the Civil War. Neither of these regimes lasted more than a decade. In a federal government, sovereign power is given to both regional and central governments. A strong and clear constitution is needed in order that power is clearly divided. This notion of a separated government was popularized by the Constitution of the United States and can be found in modern politics in countries such as Canada, Germany, and Spain. The third form of government, that neither the Articles nor the Constitution proposed, is a unitary government. Unitary governments place all power in the central government. Acting like the opposite of a confederacy, regional governments only have the power that is given to them by the national government. Modern unitarian governments include Britain, France, and Italy. This article helps answer “why did the articles of confederation fail?” Themes: failures of the articles of confederation, articles of confederation lack of unity, flaws of the articles of confederation, articles of confederation ineffective, problems with the articles of confederation, reasons why the articles of confederation failed, flaws of articles of confederation, failure of articles of confederation, limitations of articles of confederation, powers or institutions the national government did not have under the articles of confederation, articles of confederation and taxes, articles of confederation and currency. Yale Law School: Lillian Goldman Law Library, Articles of Confederation: March 1, 1781, 2008, http://avalon.law.yale.edu/18th_century/artconf.asp; accessed June 2012. Hank Edmondson, Articles of Confederation and Perpetual Union. Yale Law School: Lillian Goldman Law Library, Articles of Confederation: March 1, 1781. Sarah McNeil, Articles of Confederation, 2012 June, http://www.digitalhistory.uh.edu/database/article_display.cfm?HHID=277 (accessed 2012 June). David P. Szatmary, Shay’s Rebellion: The Making of an Agrarian Insurrection, The University of Massachusetts Press, 1980: 43. Not all members of the Continental congress could agree upon what form the new government should take. Should it be Unicameral or Bicameral? should representation be determined by state size or should all have equal say. The Articles of Cofederation could be be seen as a comprimise. Congress wanted to add legitamcy to the young nation after Independence was declared, but many delegates were still very fearful of creating a central government with too much power that would dissolve into tyranny. The Articles of Confederation were an attempt to unify the colonies on the war front, appeal to european powers that may be interested in helping the United States all the while creating a government that left the states powerful and soverign. Not to be rude, but it is Shay’s, not Shays’s. Other than that, awesome! So let me get this right the “founding fathers” wanted to get away from a tyrannical strong taxing centralized government. So they decentralized the government and gave the states rights and freedom only to go back to a tyrannical strong taxing centralized that does the exact same thing as the one they fought a war to break away from? Something don’t add up. “it took the consent of nine of the thirteen states to approve legislation” – The articles say that it takes a majority. That would be 7/13. Not 9. “the lack of a presidential figure” – Except they did have a president of congress. You might be right that person wasn’t conducting foreign affairs tho.